Black Forest Cake made with canned, drained, rinsed and patted dry apricots. Special occasion cake (see front cover of Low-Carbing Among Friends, Volume-2) that is more for grown-up tastes than for children. This would be a wonderful cake to celebrate Valentine's Day with your sweetie or honey. What endearment do you use to call your other half when not using his/her name? If desired, use fresh strawberries instead of cherries or apricots. This is a lovely cake with tea or coffee or as the finale to a lovely, romantic meal. I have been making this cake since forever it seems. It is, however, overhauled to make it gluten-free and it is just as lovely as before, if not better. Hope you all have a wonderful Valentine's Day. Preheat oven to 350°F (180°C). Prepare 3, 8-inch (20 cm) round cake pans by spraying with nonstick cooking spray and lining with parchment paper on the bottom only. Spray top of paper as well. In food processor or electric mixer, cream butter and egg yolks with liquid sucralose, OR SPLENDA® Granular and erythritol. In medium bowl, combine Gluten-Free Bake Mix, cocoa and baking powder. Beat egg whites with cream of tartar until stiff (use a smaller bowl if possible, and make sure it is absolutely dry and that there is no residue of fat). To egg yolk mixture, add dry ingredients and whipping cream and water in 2 additions, beating 1 minute after each addition, until smooth. The batter will be fairly thick. Fold egg whites well into cake batter (it will be somewhat lumpy) and spoon equal amounts into pans. Bake 15 to 20 minutes. Allow to cool on cake racks. Filling and Topping: In small bowl, combine pineapple juice, OR pineapple extract and water, liquid sucralose, OR SPLENDA® Granular and brandy extract. Sprinkle some over each cake layer. 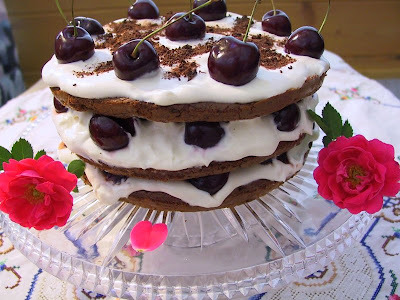 Spread bottom cake layer with Crème Fraiche and place 10 cherries (pitted and cut in half) down. Repeat with next cake layer, ending with final layer and 10 whole cherries for garnish.